Patrice Bourdin, president of Pastel in Brittany, invites you to join him from 10 to 25 August 2019. In Fougères (35) for the pastel biennale. Come meet many international pastellists with American honor guest Richard Mc Kinley. Pastels Girault are, as usual, partners in this great event. 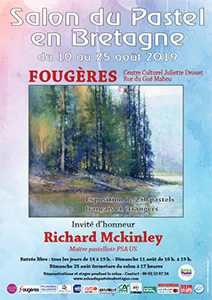 So we will be present with our material and in particular the compositions of Richard Mc Kinley, the weekend of the opening and the vernissage. We will also be offering a conference on Pastels Girault, Sunday 11/08.